Bulgarian violinist Denitza Kucera, born Kostova, has been an active soloist and chamber musician from an early age. Graduate of Plovdiv School of Music, Bulgaria, class of Tatyana Krasteva, Denitza frequently soloed with the Plovdiv Philharmonic, Pazardgik Symphony, Kurdjali Symphony and other orchestras in Bulgaria. She was winner of numerous national music competitions. In 1991 Denitza was accepted with a full scholarship at the Idyllwild Arts Academy, in the studio of Todor Pelev. While in California, she was winner of the Rio Hondo Symphony Music Competition and appeared as soloist with the Rio Hondo Symphony and the International Chamber Orchestra, with which she recorded her first CD in 1992. In 1993 Denitza continued her studies at the Oberlin Conservatory with Prof. Taras Gabora. She won the Bach competition, part of the Kingsville International Young Artist Competition in 1995, and played numerous recitals in Oberlin, Southern California, Canada and Italy, where she recorded her second CD in 1996. 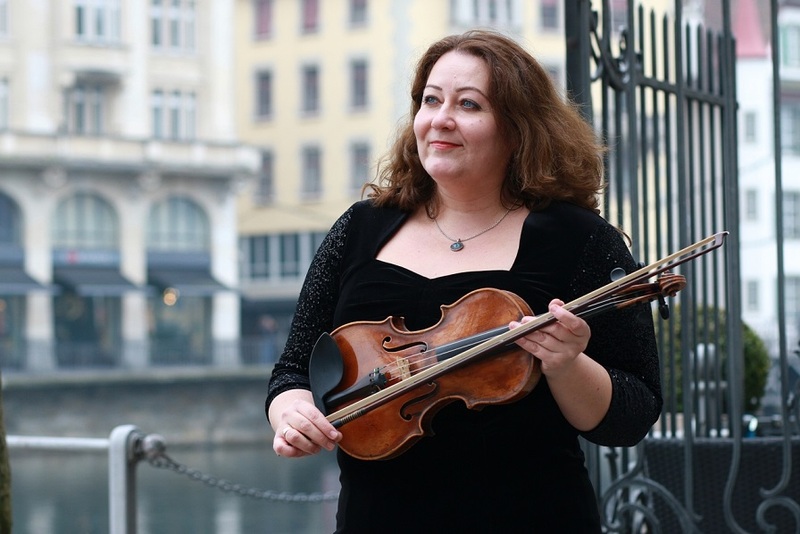 In 1997 Denitza won the Montgomery International Violin Fellowship Competition, and served as concertmaster of the Montgomery Symphony for one year, and was also a soloist of the Montgomery and Auburn Symphonies. In 1998 Denitza became a student of Donald Weilerstein at the Cleveland Institute of Music, and received her Master of Music Degree in 2000. She was winner of the Tuesday Musical Club Competition in Akron the same year. In March 2000, Denitza won the CIM concerto competition and appeared as soloist with the CIM orchestra in the Spring Concert Series 2001. Denitza was founder and first violinist of the Mephisto String Quartet, laureate of the Coleman Chamber Music Competition . She has participated in the festivals in Ravinia (USA), Piovera (Italy), Johannessen (Victoria, B.C., Canada), New York String Seminar, Bowdoin (Maine), Colorado and Norfolk (Massachussets), where Mephisto was awarded a fellowship for intense studies with the Tokyo String Quartet. Denitza was Professor of Violin at Mercyhurst College (Erie, Pennsylvania) from 2001 to 2002 and is on the faculty of Apple Hill Chamber Music Festival since 1997. In the summer of 2002, Denitza moved back to Europe. From 2002 to 2003, she was concertmaster of the Aarau Symphony Orchestra, followed by a 2-year contract with the Tonhalle Orchester, Zürich. She is a member of the Lucerne Symphonic Orchestra in the first violin section since 2005. From 2007 Denitza became a member of the Alpha Ensemble and the Luzerner Streichoktett. From 2007 to 2010, she was a member of the Alpha Ensemble. In 2013, Denitza founded the Lucerne based Vector String Quartet. The Quartet is prominently featured in Switzerland.